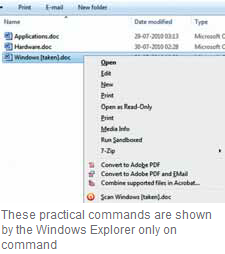 You want to insert a path to a file in a Word document, or you want to call up a folder in Windows Explorer from a command window. This involves a lot of typing and clicking. With an additional key, you can make available a few hidden items in the context menu. For this, press and hold [Shift] while you click an icon of a file or folder. The context menu then shows the previously hidden commands, which accelerate a lot of actions. The command ‘Copy as Path’ is available for files and folders. Use this command to copy the name of the file or folder along with its complete path in the clipboard. Then you can insert this information in a Word document using [Ctrl] + [V]. Other applications can be inserted as well using the shortcut [Shift] + [Insert]. The name appears in inverted commas. The command ‘Open Command Window Here’ is now available in the context menu of folders. This command helps directly open the command line instead of going through the start menu. What is extremely practical is that you directly find yourself in the previously clicked folder and therefore typed commands can immediately edit the files in this folder.